Our policy has got the deficit down by 25%, it is every single day delivering in the World bond markets record low interest rates for this country, which shows that it has credibility. The economy was going backwards and he justified this austerity with a claim that bond markets had to be satisfied. Earlier this year, Australians were bombarded with a new round of AAA credit rating mania. It started when talk turned to raising the voluntary public debt ceiling that our stupid government created to apparently demonstrate it was capable economic managers. The debt ceiling was like the Australian Football League bosses telling the scoreboard at each game that it could only display some fixed points and when those points were reached the games would have to stop until the bosses told the scoreboard they could display more. That is how stupid the whole debt ceiling charade is for currency-issuing governments. It’s no surprise Australia’s AAA credit rating is under immediate threat given we have a government that is now breaking the tests it set for itself just a few years ago … As the budget situation has become more urgent, the government’s actions to repair the budget have become less urgent. The government needs to stop the politics and lock in our AAA credit rating by implementing long-term structural budget reforms like Labor’s policies on negative gearing and capital gains. Which was an idiotic thing to say. And was topped by the response of the Treasurer when he said that by cutting the deficit (and debt) they were clearly enjoying “high investor confidence in the government’s sovereign bonds”. And we would report countless cases of this sort of mindless narratives. I have written extensively about this in the past. 1. Bank of Japan is in charge not the bond markets. 2. More fun in Japanese bond markets. 3. US Bond Markets cannot bring down Trump. 4. Who is in charge?. An Bloomberg article last week (March 30, 2017) – Spotlight on BOJ Moves From Monetary Policy to Market Operations – provided further real world evidence that bond markets are powerless when it comes to dealing with central banks. This sort of “yield-curve control” is a simple monetary operation which overwhelms any intentions that the private bond investors might think they have the power to pursue. When the central bank offered to buy fewer bonds than expected in February, 10-year yields shot up. A few hours later, Okuno and his colleagues brought the rate sharply down by offering to buy an unlimited amount of bonds at a fixed rate. The bond traders are force to eke out their activities “living on the smallest changes” – mendicants searching for crumbs. So next time you hear an economist or a politician talk about how bond markets have to be satisfied and they use that as a justification for hacking into public spending (and driving up unemployment and poverty rates) you know they are lying and are frauds. The bond traders never have to be satisfied. They can be forced to live on crumbs by the central bank if it so chooses. Apparently, not everyone understands that last point. When talk turns to topic of the biggest risk takers in financial markets central bankers do not usually come to mind. But the record shows Swiss National Bank President Thomas Jordan and his counterpart Haruhiko Kuroda at the Bank of Japan have accumulated massive books of risk assets, funded by unrestrained issuance of their own currencies, now matching the size of their respective economies. A safe-haven induced rally in the Swiss franc or a sell-off in the Japanese bond market would wipe out the equity of either central bank, forcing a government bailout and causing chaos in global financial markets. My response – total nonsense. Apparently, the SNB has “foreign currency reserves … equivalent to the country’s GDP”. Sounds a lot! (well USD670 billion). A tidy sum. 20% of the reserves are held in stocks … (the SNB is one of the biggest holders of Apple stock, larger than any US pension fund). Plenty of FX, interest rate and stock market risk. That iPhone 8 better be a winner or the Galaxy 8 a loser! Not! Similarly, the Bank of Japan now “own 40% of the amount on issue in the world’s second largest bond market”. Which should tell you something, given that interest rates have been around zero for more than two decades, there is no inflation problem and 10-year bond rates on government debt are being managed at zero. As is the case in Switzerland, the Japanese central bank balance sheet is close to the size of Japan’s total GDP. But it seems no red lights are flashing at the BoJ: it’s onwards and upwards: 2% inflation or bust! What that “bust” would mean for global markets is the big question. A pretty small question really with an even smaller answer (if small and short are commensurate!). That answer: Nothing much. The Bank of Japan and Swiss National Bank have been given free reign to build up huge balance sheets and, with no apparent consequences, seem determined to press their luck still further. Nobody knows what the end point will be, or when it will come. But come it will. Yes, time is one-directional. That is about all that will come. Tomorrow. F*c8ing putting up with that sort of nonsense is enough to … [insert the end point you choose]. 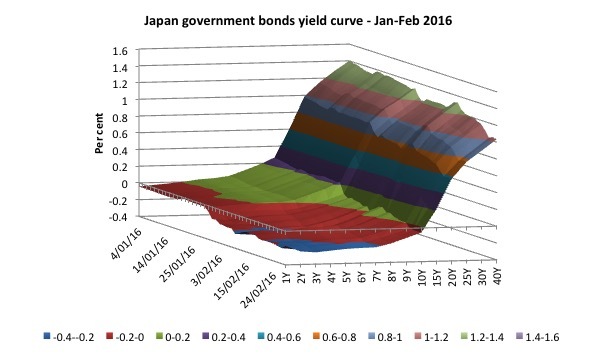 I have been providing readers with a yield curve history for Japan for some time now. Here is a little update. For background, read – More fun in Japanese bond markets. The fact that the Bank of Japan has been buying up government debt at its leisure is because it can add bank reserves denominated in yen anytime it chooses and up to whatever amount it chooses – without constraint. The next three surface charts let us see the evolution of the JGB yield curve as the policy position of the Bank of Japan has changed over the last year. The depth axis shows the date – which in the first case is from January 4, 2016 to February 29, 2016. 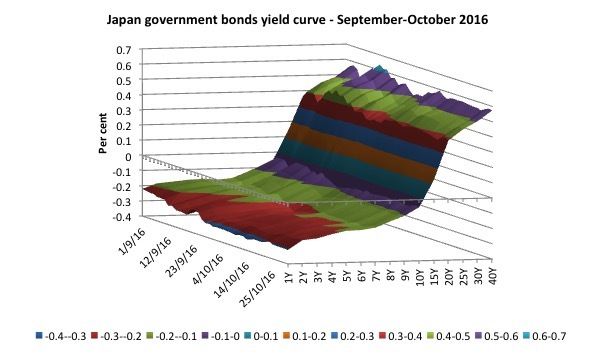 The next graph is for the Japanese government yield curve between September 1, 2016 and October 31, 2016 and depicts the extraordinary situation where the yield curve has continued to flatten throughout the year (compare the two surface graphs) and the yields up to 10-year bonds are more negative than previously. At October 31, 2016, the 15-year bond was yielding just 0.127 per cent down from 0.599 per cent at the start of the year. It will continue expanding the monetary base until the year-on-year rate of increase in the observed CPI (all items less fresh food) exceeds 2 percent and stays above the target in a stable manner. So nothing different from the strategy launched last year. Big purchases of bonds in the 10-year maturity range. The next graph shows you what happens then. The central bank is in complete control. 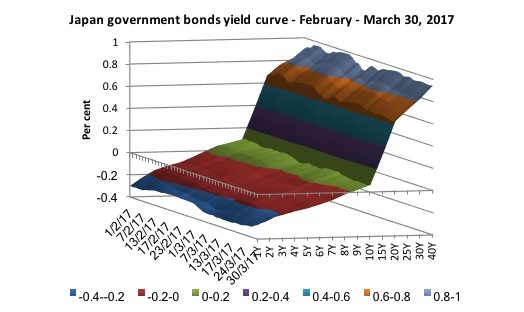 You can see that the 10-year maturity and below are tapering from zero (actually 0.062 for the 10-year bond on March 30) down to -0.273 (for the 1-year bond). So ‘investors’ are handing over yen to the Japanese government at a loss for up to 10 years. Some power to bring a government down that is! And you can also see that beyond the 10-year maturities, the Bank of Japan has eased off demand for the bonds and the yields have risen a bit (still only 0.946 per cent out to 40 years). So the Bank has been handing out some ‘corporate welfare’ to the banks and pension funds by artificially shaping the yield curve to give them some return. In a progressive world, the central bank could just drive all these mendicants out of business, the government could nationalise banks and create a national pension fund – and everyone would be better off – and long-term interest rates for borrowing on real productive projects would be very low into the bargain. But let us get back to the hedge fund analogy. It is clearly false. Goldman Sachs can go broke. Many investment banks have gone broke while others have survived because governments have bailed them out under the privatise the gains, socialise the losses that is the characteristic of this neo-liberal era. The standard mantra is that private markets are efficient and governments are evil until the private markets stuff up and then government cash handouts are furiously sought and all is quiet until the CEOs pay packets are once again secure. Then the standard mantra repeats. The point is that if, say Apple shares went to zero, the SNB would just type in some numbers (or delete some in this case) in their accounts and the day would go on, even if those typographical efforts rendered it negative capital. So if the SNB made ‘losses’ because Apple shares collapsed in price or the Swiss franc suddenly depreciated and it found itself with ‘negative capital’, which in the case of a private corporation would amount to balance sheet insolvency (that is, it was broke) what would happen? First, it would not mean anything in terms of it capacity to meet any financial obligations that the SNB might have. There can never be a ‘run’ on a central bank because its monetary liabilities are non-redeemable and all assets and liabilities are ultimately denominated in the currency of issue in the country it operates in. It can always pay interest on reserves if it chooses and provide reserves as required. Further, the private analogy is inapplicable in the same way that the household-government budget analogy is flawed when applied to a fiat monetary system. For a private corporation (like a commercial bank), they would have to swap sound assets for equity when recapitalising. This would not apply to a central bank which, depending on the relationships with the treasury, could either just type in some numbers to restore its own capital or ask the treasury to do so. Some would reply by saying this sort of ‘bailout’ would be politically costly or amount to a loss of central bank independence. Of course, all manner of contrivances emerge very quickly in modern politics when they have to. Which is the standard Modern Monetary Theory (MMT) definition of a risk-free sovereign government – one that only issues liabilities in its own currency. If the consolidated government sector – the central bank and the treasury – issue liabilities (for example, take on debt) – that is denominated in a foreign currency, then insolvency becomes a possibility. If you or I accumulate financial assets which carry some credit risk then we can quickly go broke if the holder of the liability defaults on payment. We are currency users and thus are bound by the fact that any assets we hold are offset $1-for-$1 by a liability held by another currency user. Bonds issued by a sovereign government (currency-issuer) carry no credit risk. The argument that these central banks are exposing themselves to credit risk (buying up dodgy assets) and could go broke is erroneous. The BOJ scare talk is also not new. It recycles regularly. And, it never amounts to anything other than to fill up newspaper column inches or, more recently, Internet bandwidth and screen pixels. Please read my blogs – Better off studying the mating habits of frogs and Who is in charge? – for more discussion on this point. The narrative that asserts that governments have to assuage the sentiments of the bond markets – which is an oft-repeated claim to justify job-destroying and poverty-inducing austerity – is just fake. It is a lie. It is just one of many lies that the elites use to pursue their biased austerity. Biased because they never advocate cutting spending or government support that helps them. They just support cuts that help the most disadvantaged who have little political voice and so can be disregarded. The point is that currency-issuing governments never have to worry about bond markets. And it would be better if the government eliminated the public debt market altogether – then the bond traders would have to do something productive for a living and get off the corporate welfare teat! Mendicants added to my english vocabulary. Excellent. The question is how to convince governments of this fact. Anyone got any good ideas about that? Could you please explain how monetary operations work? How to the bond dealers make a profit? Is this some kind of gift from the govt to the bond dealers? How much of BOA or City profits come from dealing in govt bonds? The experiences of the Egyptian Pound, which recently floated, is a very interesting case study. Floating stopped the capital flight stone dead, but has caused supply side inflation which the central bank has, unsurprisingly, been unable to stop with interest rate rises. Instead it is drowning the private industry expansion it needs to restore the terms of trade. Nobody has suggested rationing and preventing imports of luxuries as yet. It’s so frustrating watching this happen, although I’m not sure exactly how much power the Egyptian government has in the country to direct resources. More welfare cuts (brought in by wallet-lining Osborne) hit those on various benefits in a few days which will cause an estimated 10% increase in child poverty by 2020. This is one of Bill’s strongest posts yet on this subject, here in the UK it would be good if we could have this blasted out on loud speakers on a daily basis until the myths and mental wallpaper are dispelled. I wonder how many of the politicos are ‘lying’ in the sense that there is ‘intentionality’ rather than just plain vanilla ignorance to the power of infinity. The politicians in the UK seem to be a bunch of chancers, wallet-liners and general piss-takers who seem to be getting away with inflicting indignity after indignity while the populace cowers – needs some sort of psychopathalogical explanation. The Egyptian government seems unfamiliar with using the floating pound to stimulate domestic production. Farmers are getting too low a price for wheat, making their business impossible; there’s rampant corruption with bakeries selling subsidised wheat in the Black market; and to create nothing less than a revolution, the IMF has -if i read correctly- put pressure on the government to cut energy and food subsidies when it granted the 12bn dollar loan, and have the government impose a 14% vat! The domestic approach has been entirely wrong headed – as usual. South Africa is suffering today from precisely the narrative exposed as a lie in this piece. A downgrade would make it more expensive for South Africa to borrow money on the international markets, as lending to the country would be seen as riskier. Is the disease ignorance based upon something akin to religion or is it malevolence? Does one need another way to get sense across to the public, journos and politicians? What does one do? Looks like someone’s at least trying to get the message out in Sri Lanka! my curiosity with all of this is , yes the central bank controls the yield curve, but what is the correlation between bank funding in international markets and the central bank interest rate targets. does one peg the other , or is the importance of the AAA credit rating have to do with private sector borrowing costs which the central bank may not be able to control . “Floating stopped the capital flight stone dead, but has caused supply side inflation which the central bank has, unsurprisingly, been unable to stop with interest rate rises. Instead it is drowning the private industry expansion it needs to restore the terms of trade. low interest rates and government support to facilitate private sector expansion in strategically important industries, and high tariffs on luxury non strategic imports ? One of my favourite lines ever written in macroeconomics. Very graphic, like pigeons running for the crumbs of the sandwich you’ve just finished eating. If Japanese Government is paying 0,062% interest on a 10-year bond, why not stop issuing debt at all and move on to Overt Monetary Financing? The BoJ could even pay 0,025%, for example, on excess reserves as a symbolic figure to calm down investors’ desires for corporate welfare, but at least the BoJ and the Japanese Treasury could show the world that issuing bonds is not necessary for a sovereign country to deficit spend. This for sure would change people’s perception of fiscal deficits and might become easier for governments to spend as much money as their economies needed to fight unemployment. Perhaps all politicians should be taken to a tour in a central bank and shown all machinery that holds nations currency. Whenever one mentions the case of Japan with debt/GDP of 230% as an example of how the Central bank has control over bond sales and interest rates -people always reply : ‘well, Japan is different’, or the ‘culture is different’ as if the operations involved were ‘cultural’ in some way that made it workable only in japan! There’s always a get out clause! “In a progressive world, the central bank could just drive all these mendicants out of business, the government could nationalise banks and create a national pension fund – and everyone would be better off – and long-term interest rates for borrowing on real productive projects would be very low into the bargain.” -yes quite! The debate oin the economy and public spending in the UK is plagued by the household model of running the economy. It has literary echos! There is Mr Micawber and his dictum on happiness and solvency around an income of 20 shillings but this model does not universally suit the political narrative sometimes so the Humpty Dumpty approach is adopted – resolving the (government) deficit means what I choose it to mean, neither more nor less! So when cutting benefits to the poorest Mr Micawber appears but when renewing Trident (£100bn over 30 years) Humpty Dumpty pops up. This paper has clarified my thinking on the illusion of what I call Micawber moneynomics! I am not an economist, but I have worked hard to understand the phenomenon of money in the twenty first century and believe I understand enough of the operational reality to know that the problem for the layman is one of cognitive dissonance – that is to say we have been brought up to believe that money is a ‘ thing ‘ and all the language used to describe it emphasises that e.g. ‘ capital flight ‘ to use a more esoteric one . But nothing is moving other than a computer mouse and then you try to explain this to a friend who isn’t particularly interested in the subject and you will get either a very funny look – in other words you are mad – or simply a blank look which is to say you are talking nonsense. Either way even in our almost cashless societies it is very, very hard to convince anyone who hasn’t looked into this subject that money is not a thing and I think that professionals like Bill might address this in a more down-to-earth way if they are to reach more people with their message which I wholly support by the way . Hey, could you settle an argument I’m having? A friend of mine is under the impression that the Australian government “prints money” to fund the deficit rather that issuing bonds. I understand that’s what you are proposing here and he links this article as his proof of the government creating money. Could you explain that that’s not what they presently do?